Judging by the number of emails I've received lately asking where to shop for bridal fabrics, the holidays still remain a prime time for couples to get engaged. My standard answer to this question is Mood, B&J, Lace Star and Sposabella, plus M&J Trimming's bridal department, but I have to confess I haven't actively looked for or thought about bridal fabrics and trims in a long time. So readers, help me out here: Have you shopped for bridal fabrics or trims in NYC recently? If so, where do you recommend brides-to-be head first? If you have any photos of your bridal gown or bridesmaids gowns that were made from fabric purchased in the Garment District, email them to me and I may post them here. Thanks! 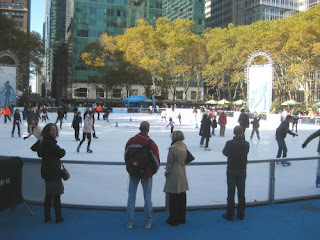 It's Sunday night as I write this post and the snow is still coming down in the New York area. Fingers crossed it stops soon so the sidewalks can be cleared and I can make my way to Elliott Berman Textiles' holiday sale. They'll take 15% off purchases in-store and on their website between now and Dec.31. I'm looking for boucles, wool doubleknits, cotton failles.... And don't forget Paron's will take 20% off in-store purchases between now and January 15 if you mention Shop the Garment District. It's the perfect time to build your stash for 2011 sewing! The fabulous Kenneth King is in the house! Here he pairs a leopard-skin jacket he made with jeans and a Kenzo scarf. If you sew your own clothes then Kenneth King is no stranger to you. Couturier, author, Threads contributor, FIT professor, sewing class teacher, and hip hop music video extra (he played a pimp), Kenneth is a wealth of information on many topics, some of which even pertain to sewing. I chatted with him recently about my favorite topic, shopping in NYC's Garment District, and was surprised to learn he favors the small stores on W.39th Street over the more well-known stores with the pricey fabrics. A proponent of supporting local independent stores no matter where you live, Kenneth bemoans the contraction of the Garment District as production continues to move overseas. Ack, don't we all. STGD: What are your favorite fabric stores in the Garment District? KK: I do most of my shopping on W.39th Street. I start at Chic Fabrics, then Fabrics For Less, followed by Weaver's, and then G&R which is really good for leather. Chic Fabrics has the best prices on silk organza in town, and I just saw some beautiful wools there for $10 to $12 a yard. Fabrics For Less has a really nice wool doublecloth that is only $12. A client who was shopping with me thought that price for doublecloth had to be a mistake. [editor's note: I saw that doublecloth myself and it is gorgeous—heather gray on one side and red on the other, very soft to the touch] Fabrics For Less also has really good linen for $6 a yard. Weaver's is great for silks and getting silks dyed to match. Check out this slideshow on the Garment District in today's New York Times Business section. The department stores may be packed with holiday shoppers but it's quiet in New York City's Garment District. Seems acquiring fabric is the last thing on folks' minds right now. However, it's a great time to score some deals on fabric because the stores still want to make money. Earlier this week I walked away with nearly two yards of designer metallic brocade from a mid-level fabric store for only $6.50! Tell the store owners or staff what you're willing to spend and take it from there. Let me know what you buy, ok? Just to let you know, it is my policy not to publish disparaging remarks that are left anonymously or by using someone else's Blogger profile. Please feel free to express your dissatisfaction with any of the stores or services mentioned in Shop the Garment District, but own up to your remarks. Thank you. Magaschoni cashmere infinity scarf, $210, Bloomingdale's. You could make one of these scarves in cashmere for a fraction of that price. Once again, anything in cashmere is hot for the holidays. Why not make cashmere infinity scarves for your friends and relatives? Mood Fabrics in NYC's Garment District has tissue-weight cashmere knit for $60 a yard, 64 inches wide. You could get two scarves out of that. Or, you could make a double-sided scarf, like this Burberry scarf at Bloomingdale's: One side is cashmere, the other is wool you have (maybe) in your stash. If sewing activewear or swimwear is your thing, or you make costumes for ballet and dance, you need to visit Spandex House in NYC's Garment District. 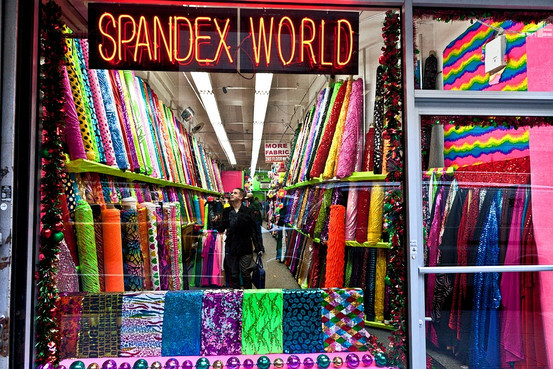 This store is the epicenter of all things spandex and lycra. The prices are reasonable, the bolts are wide (usually about 72 inches), and the sales staff is attentive. B&J Fabrics has Sunback lining for coats and jackets in loads of colors, even some prints, like this paisley above. A relative of mine just bought a really cute duffle coat at J. Crew Factory, but after wearing it this weekend she realized it wasn't going to provide her much warmth. So I told her I'd replace it with a heavier lining fabric, known as Sunback or Kasha lining. It's satiny on one side and like a soft flannel on the other. Really boosts the warmth factor without adding bulk. I called the fabric stores in the Garment District I thought might carry Sunback lining: Mood, Rosen & Chadick, NY Elegant and B&J. Mood only has it in hunter green ($12/yd), Rosen & Chadick carries only a couple of colors and charges $20/yard, and NY Elegant has several colors at $12.99/yard. But B&J has oodles of colors, even a print or two, at $10.95 a yard! That's lower than the online prices I've found for Sunback lining. I never thought B&J would be the winner in this category, but there I go again, underestimating this store. I bought two yards of Sunback lining in a paisley print (photo above). Call them at 212-354-8150 and ask for swatches, or visit their web site: B&J Fabrics. Tell them Shop the Garment District sent you! Note: I swear I saw Paulina Porizkova buying fabric in B&J when I was there. Had to be her. You know how when you take a friend for the first time to a store or place you love, and you're always a bit nervous that they might think it's awful and you're off your rocker? That's how it was when I brought AllisonC, Elizabeth and Carolyn to Elliott Berman Textiles today. I visited this fabric showroom in the garment district about two weeks ago, on the recommendation from Cathy whom I met at PR Weekend in May. Well, I loved it. What's not to love? : designer fabrics at better-than-retail prices. But what would my three friends—who all have excellent taste when it comes to fabric—think about it? Dear readers, I am pleased to report they are as thrilled with Elliott Berman Textiles as I am. They all bought some fabulous pieces which I know they're dying to share with you on their respective blogs (give Allison some time to return to Hong Kong though). Here's what you need to know about Elliott Berman Textiles: First of all, they are primarily a fabric wholesaler, supplying fabrics to many of the finer fabric stores in the garment district and elsewhere. They also have an online business, and their sales and promotions are very popular among sewists in-the-know. And they'll sell to walk-in customers like you and me—the four of us thought their retail prices were very agreeable. Not to boast, but we know our fabric prices so we can tell when we're getting a good deal. Join their website mailing list and Eugenia says they'll honor any online promotions when you visit the showroom. And the customer service is exceptional! Matthew, Eugenia and Harvey are friendly and helpful but not smothering. They clearly love what they do. Did I mention the designer names? Elliott Berman Textiles features Yves Saint-Laurent, Chloe, Gianfranco Ferre, Gucci, Prada, Versace, Valentino, Dolce & Gabbana, Roberto Cavalli, Missoni, Fendi, Laura Biagiotti, Loro Piana, Escada, Chanel, Calvin Klein and too many others to list here. Eugenia was more than happy to let me fondle a Chanel matelassé she saw me drooling over. I love to pet designer fabrics. Here's Eugenia with a DKNY lightweight brocade that we all agreed would make a stunning trench coat. These are some of the gernerously-sized swatches Elliott Berman Textiles has on hand to send to its customers. Eugenia says they are more than happy to send swatches to customers who call and describe what they're looking for. A Marc Jacobs silk charmeuse. I can't remember which designer this was from; I just know I loved it.